Fraction calculator with steps helps you calculate fractions, mixed numbers and whole numbers. 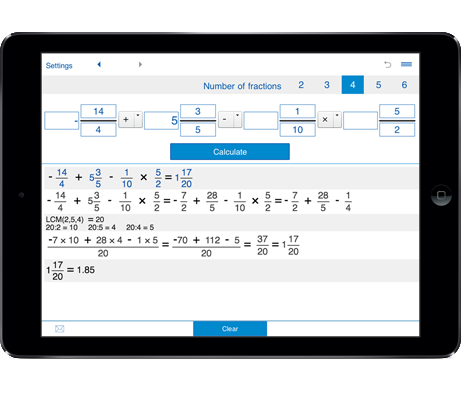 With fractions calculator you can divide any combination of fractions, mixed numbers, and whole numbers. It is a handy fraction calculator to divide fractions, mixed fractions and whole numbers. You can use this fraction division calculator for dividing two, three, four, five, and six fractions, whole numbers and mixed numbers. Select the number of fractions for fraction division. You can select 2 fractions, 3 fractions, 4 fractions, 5 fractions, or 6 fractions. Then enter the fractions in the provided fields and click "Calculate" to find the result.